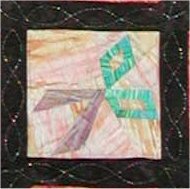 This is the continuing saga about my journey to make a Challenge quilt. We've already seen my mock-up to see what a potential sashing layout would be like. 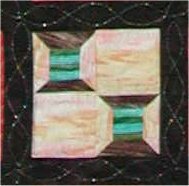 As I was going through my own reference library, I rediscovered a book that featured paper-pieced sewing motif blocks. 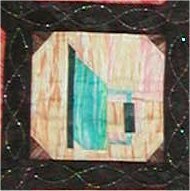 I figured this would be a good design, as I could use a lot of different Stained Glass fabrics in the individual blocks. 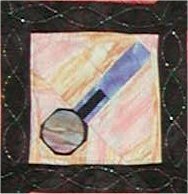 The book is "Needles and Notions" by Jaynette Huff. It features 12 4" paper-pieced blocks that feature sewing room implements of destruction. I love paper-piecing so this layout seemed to be ideal. 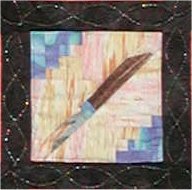 The quilts in the book all have a standard grid sashing with cornerstones and sashing squares. The problem with this layout is that everyone has seen a millions times and, for me, it just wasn't special enough for a competition. After I made sure that the Garden Maze layout was going to work for me, I modified the Garden Maze sashing paper-piecing pattern to accommodate the 4" blocks in the Needles and Notions book. 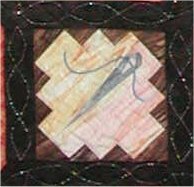 It was easier to make the Garden Maze sashing larger than to make each of the sewing motif blocks smaller. Using the mock-up as a guide, I chose a color for the background and started making the maze sashing. Then I started in on the paper-pieced blocks. When I combined the sashing and the blocks on my design board, I realized I had made a tactical error ... the background in the sashing and the background of the blocks were too near in value ... there wasn't enough contrast to make it look interesting. Well, rats. Although the sashing background looked very pretty, it just wasn't going to work with the blocks .. and it was easier to re-do the sashing than to re-do the blocks. So, the original sashing/background have now been put aside and will be (eventually) used in another project (someday). 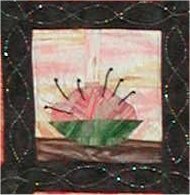 The second time around, I chose a very deep burnt orange Stained Glass fabric, which offered the necessary contrast to the block background. Unfortunately, I was running out of the black Moda Marbles that I was using for the sashing .. a quick trip to my LQS was a disappointment ... they were out of stock of the Moda Marbles, although they did have the Timeless Treasure line. Unfortunately, though similar, the two lines are different enough so that they can't be used interchangeably. This meant that I had to buy the Moda line online ... and wait for it to arrive. In the meantime, I continued making the paper-pieced blocks. Eventually, the black Moda Marbles arrived and I was able to make the sashing rows to surround the first row of blocks. 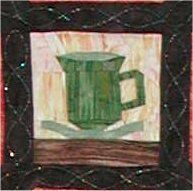 When I put everything up on my design board, I realized that although this was going to be a very nice quilted wall-hanging, it just was not going to have that special something that winning quilts need at competitions. I really was disappointed because in my mind, it sure looked good. Maybe it was my choice of sashing background fabric .... who knows? 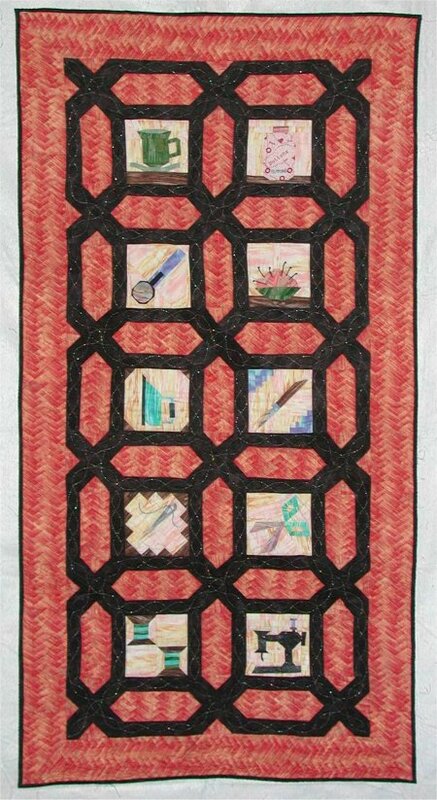 But the bottom line was that this quilt wasn't going to be entered in the Challenge Contest; needed to think of something better. 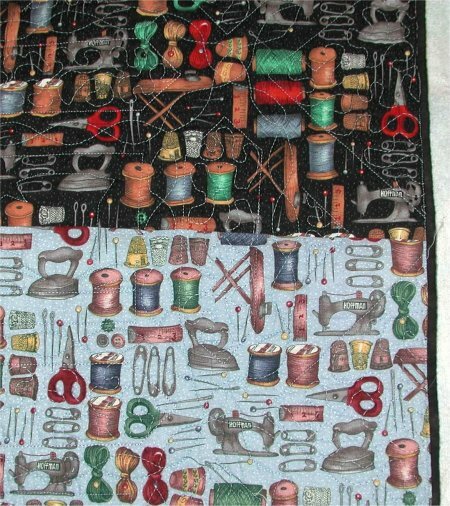 I did finish the "Sewing Notions" wallhanging. 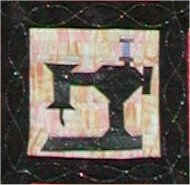 The completed wall-hanging has blocks (as shown above) of a sewing machine, scissors, a seam ripper, a rotary cutter, a needle, a pin cushion with pins, an iron, a tea cup, two spools of thread and a button jar. There are two other blocks from the book (a tape measure and a thimble) that I chose not to make. For the backing, I chose a sewing room themed fabric from my stash in two colorways, as the blue background wasn't long enough for the entire wall-hanging. I sewed the black background as top and bottom borders. As for what I actually ended up creating for the Challenge, read on .. the Next button will take you to it!